Which is better? This is the big question after Huawei and Samsung, the two heavyweights in the industry, presented their first folding smartphones. Because they're such different takes on the daring new concept. We have compared the Huawei Mate X and the Samsug Galaxy Fold. Foldable smartphones are finally leading to real differences in smartphone design again, and these are reflected in the differences between the way the Huawei Mate X and the Samsung Galaxy Fold actually implement the 'folding' part. While Samsung folds up the folding smartphone like a book, Huawei's display folds from back to front. This seems less natural, but has the advantage that Huawei can do without a second, small display for the outside - the folding display encloses the Huawei Mate X completely. How this affects the durability of the Mate X is probably one of the most exciting questions. Samsung in turn places a second 4.6-inch screen at the front, which automatically shuts down when the Galaxy Fold is opened to reveal the large 7.3-inch display. When closed, the display lies inside and is therefore better protected than the Mate X. But this has the disadvantage that the Galaxy Fold has a hinge that is 6 millimeters thicker than the Huawei and does not close completely. Both solutions therefore have their advantages and disadvantages. Huawei's idea of giving the Mate X a kind of grip - where the cameras are housed - makes more than sense. After all, such a large folding smartphone also needs to be held in place, and in view of the thin case, a move is almost inevitable. In addition, the slightly thicker part of the case contains the buttons, the SIM slot, speakers, USB-C port and a few other things for which you would otherwise have had to make the device thicker - as with Samsung. There are also differences in the number of cameras, and that is already the case with the number. While Samsung places cameras on the outside and inside of the Galaxy Fold, Huawei only uses one camera in the handle. Depending on how you hold the Mate X around, you can use it in both directions. Once again Huawei has sought help from Leica. The technical specifications of the cameras in the two smartphones from Huawei and Samsung are not yet known. There is a clear winner in connectivity, and that is the Huawei Mate X - at least on paper. The folding smartphone from Huawei supports 5G, Samsung's Galaxy Fold can't. The fact that the advantage exists only on paper is solely due to the fact that there are currently no 5G networks and tariffs for private customers with which one could actually use the Balong 5000 modem in the Huawei Mate X at all - and that will remain so for quite some time. 5G support on the Huawei Mate X is therefore only a theoretical advantage. An important part of such a folding smartphone is the software, and that doesn't mean Android alone. Samsung's new One UI and Huawei's EMUI are changing Android a lot, and for such smartphones it has to be. Here Samsung seems to be already further than Huawei, because the three-part multitasking, which the Koreans demonstrated on the Galaxy Fold, already made a well thought-out and advanced impression. The Mate X - apart from small changes like the camera preview on the second display - runs the normal EMUI, which is then switched to square view when you open the smartphone. Finally something really new for smartphones! Both folding smartphones are quite close together in price. 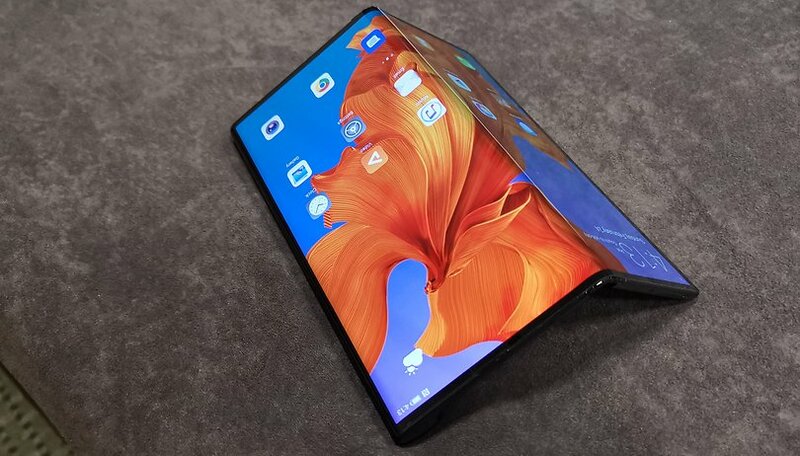 Samsung lets the Galaxy Fold cost a smooth $1,980 or 2,000 Euros, Huawei charges a price of 2,299 Euros for the Mate X, which is about $2,620, although given the difficulties between Huawei and the USA these days, you can forget about it being available in dollars for some time. Extreme early adopters will have to import the device. In any case, that's a huge chunk of money for a first-generation device that, in many respects, you can't even be sure is really suitable for everyday use. Whether you make such an investment or not is up to you. Who needs a folding smartphone? Do I need a folding smartphone in 2019? No. But do I want a folding smartphone in 2019? I can only speak for myself, but yes, I can't have one soon enough! Which of the two is the better device in the end, the Samsung Galaxy Fold or the Huawei Mate X, will be revealed when we have a chance to make detailed tests. Both have their charm, and both indicate an exciting new diversity in the market for smartphone geeks like myself. Which folding smartphone do you prefer? I have samsung j4 i want to do my sd card as internal storage ??? I Like Mate X ! Both phones are exceptional, but Mate likes me more. It's just a matter of tastes, so a subjective opinion. It gives me pleasure to announce the winner!! Don't matter what is said nothing can beat Samsung to compare this with that there's no contest. Not forgetting Bixbe don't leave home without it.